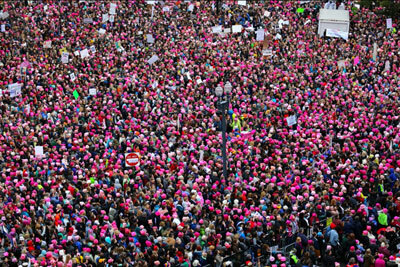 I’m claustrophobic, so what was I doing shoulder to shoulder with tens of thousands of women, children, and men on Saturday morning the 21st of January, 2017? I had volunteered to be “Press” at the event and wasn’t sure if I’d even do that until I arrived on the scene. I met Ruben, a professional videographer who had volunteered to film events at a park I had never heard of in Seattle. Waking up pre-dawn, driving an hour, catching a transit bus for another hour, riding a free parade shuttle to the park and walking several hundred yards to the media tent was how the day began. I picked up my press pass and from that moment on life unfolded far differently than I had expected. By nine o’clock we had already interviewed a dozen people; a wife and husband with a young baby carrying a Palestinian, as well as a rainbow flag, a Latino family representing three generations, two high school girls who mid-way through the interview were joined by five friends giggling with excitement and who were thrilled to be interviewed, a 70-year-old black woman standing on the hillside overlooking the rapidly expanding sea of humanity in the park. For the next two hours, we made our way through the marchers, talking to people, recording an array of concerns on so many fronts. People carried flags (Puerto Rican flags, rainbow gay flags, American flags and more) and banners (Planned Parenthood, Women Carpenters’ Union, Black Lives Matter, etc.). And signs? Thousands of signs. Some professionally printed, most likely made at home on the dining room table. Each with a different message, a different concern for the future. I never felt this was an “anti” anything march. The voices raised were of concern for the future, fear of losing ground in so many crucial areas, and support for people that care deeply about this country and the world. By 11 o’clock thousands of people stood shoulder to shoulder listening with intent to speakers who spoke briefly before the actual march started to make its way to Seattle Center across town. Because of the magnitude of people, exiting the park took hours, literally there were two hours where we moved maybe 100 yards. Patience and good spirits were abundant. At one point, someone yelled “look!” and all eyes glances skyward where two bald eagles circled against the blue sky far overhead. The crowd cheered as the birds (who are a rarity in the city) soared for several minutes before flying off in the distance. I don’t think I am alone for thinking that the eagles were a sign, a positive sign of hope for the future. March on.